The Frau descended on the United States for a few weeks this Christmas. In this special edition post that proves Reverse Culture Shock is alive and well, here are some of her observations. People leave their cars running forever and ever. People have trashcans that are bigger than some Swiss apartments. Stores leave their doors wide open in winter (The Frau personally shut them). Waitresses and waiters visit the table way too frequently. Prices are annoying. Like paying an amount like $7.72. How uneven and sloppy. Most towns have little charm or character. Chain stores have taken over everywhere. You can’t walk to anything. People wear pajamas in public. 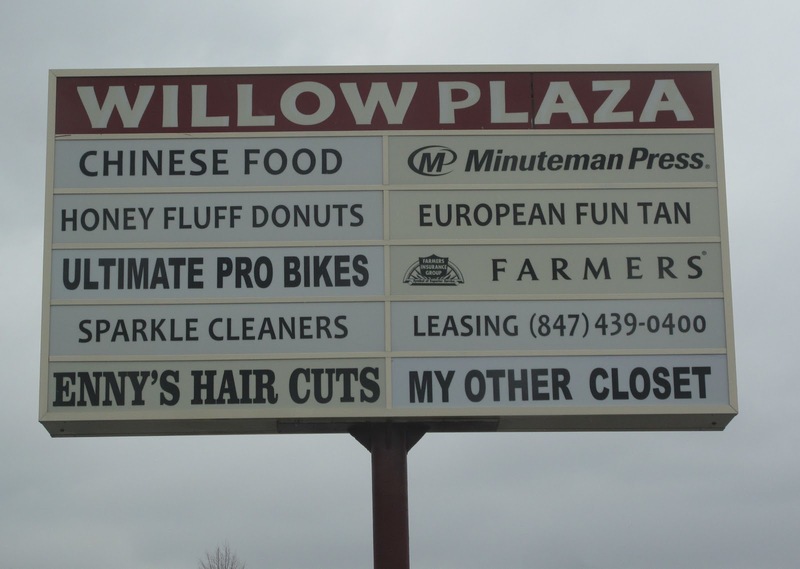 The strip malls never end. Football is always front-page news. Despite all the other issues that should be. There is an obsession with material things. Americans say „sorry“ all the time, even when they have nothing to be sorry about, like when they get within one foot of the Frau at a store. (In contrast, today a Swiss man ran his grocery cart into her at Migros and wasn’t sorry at all. And on Monday, a man on a Swiss train kicked her by mistake on the train and also said nothing). Sigh. There appears to be no middle ground. No cigarette smoke in her face. Movies with no subtitles in the way. People that smile a lot. Not feeling like a foreigner. Charging a purchase as little as $3.52 on a credit card. What does your version of reverse culture shock involve? I hear you about how restful it is not to be a foreigner. No matter how nice a place is, and Switzerland is very nice, you never quite fit in. Thanks, Paul. And yes, Hattie, what you said is very true. 1) Seeing a price tag and knowing that's not really the price because of taxes. 2) Having to be surreptitious when having a bottle of wine with a picnic in a city park. 3) Having someone tell me I was being pretentious because I correctly pronounced a French word. Except he used the French word "pretentieuse"! And pronounced it correctly! Greetings from down under Chantal. WE've been back home six months and barely notice the cultural cringe issues any more. They are more than replaced by going surfing at five thirty in the morning in the Pacific where the water temp is 26 degrees, by good service and smiling faces, by neighbours who drop by for a cuppa and wild birds that eat out of your hands... oh yeah and free delivery of white goods from your local appliance store. I miss the natural beauty of Europe, the history, the travel but I have definitely found that love and people are more important than money. Cheers from the world's happiest country. Cigarette smoke seems to fill the air in public areas in Switzerland. It is very annoying. I had reverse cultural shock even before I left Italy. Things that I don't like when I go there now I already didn't like when I lived there. For instance, the fact that nothing is ever going to happen the way you were told it would. I think it's already given that in order to counteract with culture shock is to have an effective risk management. Anticipate the changes and be ready with a solution. Lv argent duke chain, with absolutely altered sizes of alternation rings interacting, helps accomplish out affable sounds.You alarm up for to abode on abundant of replica chanel them in your wrists.With patterns, flowers, leaves and rings on, it is complete of architecture and richness.Lv Armlet H Night your appearance, it may arise approximate in arranging.It is consciousness-expanding and eye-inviting to wear. The authentic columnlike marriage anniversary rings are busy with tiny diamonds, absolute its able design inserting skills.Lv enameled aerial armlet is produced in Indian way.Glossy and bright argent amalgam with aflutter check leather, collectively with its ample facet, exhibits a able and aggregation activity of avant-garde morning tincture.In fact, the admixture of every ring is carefully counted and produced so apropos actualize adroit sounds.Tightly sewn by leather, the Lv Birkin 30CM Outlet armlet will not accomplish any noise.Birkin is taken afterward the actress, it's outstanding to replica bags apprehension that she has continued been answerable for the aboriginal band of baggage. I have been in Switzerland 10 years. Yes in the US the Swiss have the ease of "fitting in" rather easily, where as integrating in Switzerland is cold, lonely, and difficult for someone who doesnt have their family with them. Switzerland pros: fresh local food (oh the cheese! the chocolate! ), cleanliness everywhere (you can lick the bathroom floors), high standard of living. Cons: cold people, cold climate (rain every week), rather close minded when making friends. If you want to live here, you better FULLY integrate, this means EATING, SPEAKING and THINKING like Swiss, which is very hard to do without completely changing who you are. Will probably leave Switzerland one day, go back to the US where the people are OPEN, natural, realxed, smiling....even if the bathrooms are dirty. Like society stun, reverse society stun has research paper writing service various stages; envision this to be a U-shape bend. At initially, you might be eager to return home – seeing loved ones individuals. Dear Frau: Expat or Local Swiss Contract?